President Trump managed to do something during his State of the Union address Tuesday that few, if any, would’ve imagined. He got the Democratic women who protested his speech by wearing white to loudly applaud, stand, cheer, and even break into a USA chant. "No one has benefited more from a thriving economy than women who have filled 58% of the newly created jobs last year," Trump said. 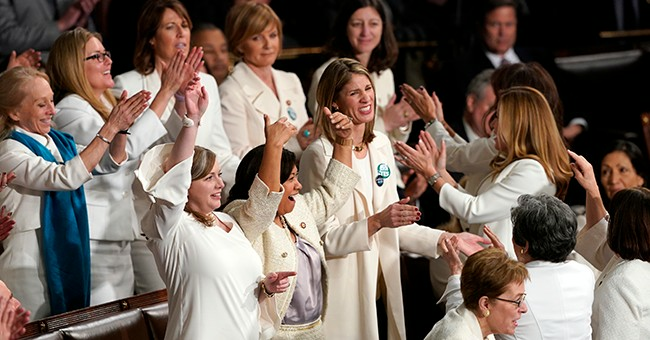 Many in the room cheered, including the Democratic women who were wearing white to show solidarity with the women's suffrage movement. The president then told the women to keep standing. "Don't sit yet. You're going to like this. And exactly one century after Congress passed the constitutional amendment giving women the right to vote, we also have more women serving in Congress than at any time," he said. The commented was widely celebrated and prompted another round of U-S-A chants. Only President Trump could ever get the #Resistance Socialists Democrats to chant U-S-A at @realDonaldTrump #SOTU ???? "Exactly one century after Congress passed the Constitutional amendment giving women the right to vote, we also have more women serving in Congress than at any time before."